2016-17 season the Champions League sixth round, Juventus Juventus Arena 2 to 0 victory over Dinamo Zagreb. 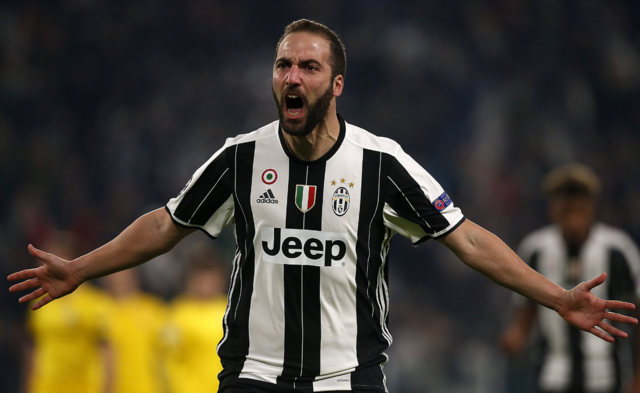 Higuain to break the ball shortage, Lugani into the Champions League at the sub-ball, Di Bala back from injury, Juventus to the group the first to qualify for the knockout. The first 2 minutes, Pianic restricted area before the right foot low shot wide. The first 6 minutes, Marchisio midfielder played, Manjukic, Pianic continuous pick, Higuain broke into the restricted area right ribs right foot low shot Rivakovic denied the bottom line. The first 15 minutes, Higuain hit West by the yellow card was warned. The first 19 minutes, Marchisio outside the area long-range missed. The first 32 minutes, Manzukic closed right ribbed buckle over the left foot after the cross, Pijanitch small restricted area header header was Rivakovic confiscated. 35 minutes, Fernandez restricted arc left foot low shot was Neto confiscated. 38 minutes, Joe Ridge restricted area outside the right foot long-range was Naito confiscated. 39 minutes, Pianic closed right ribs back to do, Lemina right foot shot higher. The first 42 minutes, Pianic kick restricted area before the left free kick right foot shot was Rivkovic flying seal. The first 50 minutes, Asamoah left foot long-range outside the restricted area was Rivkovic confiscated. The first 52 minutes, Lemina arc closed in four forced double-team breakthrough, Higuain right foot shot broke the restricted area, 1-0! Higuain into the Champions League this season, the third ball, breaking the ball since November 2, the shortage. The first 56 minutes, Patrice Evra frontcourt after the forward pass, Pianic left rib cage cross, Rivakovic attack to save Manzuki Kiki was injured. The first 61 minutes, Joe Ridge was booked. The first 72 minutes, cross-cross on the right of Quadrado, Lemina restricted right foot right foot shot was defender denied the bottom line. The first 73 minutes, Pianic kick the right corner, Lu Jia Ni restricted area header headed home broke, 2 to 0! Lugani broke two games in a row, Pianic nearly 2 appearances sent out 3 assists. The end of the game, Juventus to 2 to 0 victory over Dinamo Zagreb, the group's first-place results in the Champions League 16 strong. Juventus full-court possession rate of 64.2%, 18 shots 8 shots are scoring 2 goals, Dinamo Zagreb shot 3 shots 2 times. Pianic shot 4 times 3 shots, ranking first in the audience, Higuain shot 3 times a shot, the substitute came out of the same three times shot Di Ba La is the only time, Lugani only once Shot on the shot is.